SANTA BARBARA, California, May 20, 2015 (ENS) – Thousands of gallons of black smelly crude oil that spilled from a broken pipeline Tuesday in the California coastal county of Santa Barbara has fouled popular beaches and spread across nine miles of ocean. Reported by a passerby early Tuesday afternoon, the spill occurred near Refugio State Park west of the city of Santa Barbara. Officials have closed the popular park and have also closed El Capitan State Beach over the upcoming Memorial Day weekend. Officials said up to 105,000 gallons could have leaked from the pipeline, which is owned by Plains All American, a publicly traded company based in Houston, Texas. Plains All American has isolated and shut down a segment of the 24-inch onshore pipeline and deployed oil spill response personnel and equipment. The heavy crude was being transported from offshore production facilities to refineries when the pipe broke. The spilled oil reached a culvert leading to the Pacific Ocean. The federal Department of Transportation’s Pipeline and Hazardous Materials Safety Administration, PHMSA, which has regulatory oversight for this pipeline, has sent four inspectors to investigate the cause of the spill, the condition of the pipeline and any potential regulatory violations. A Unified Command has been established, led by the U.S. Coast Guard and including the U.S. Environmental Protection Agency; PHMSA is coordinating with other federal, state and local officials at the scene. Officials have not yet determined the exact amount of oil that was spilled, the Joint Information Center for the Refugio response effort said Wednesday afternoon. Roughly 3,000 feet of containment boom has been deployed and oil and water is being recovered by vacuum trucks from oil containment areas. Contractors are working to remove contained pockets of oil utilizing skimmers, vacuum trucks, absorbent pads, and absorbent boom. More than 272 responders are taking part in the cleanup effort and more personnel are enroute, according to officials at the Joint Information Center. Outraged environmentalists will hold a rally and press conference at noon on Thursday at Refugio State Beach. They say the spill shows how urgent it is to ban “extreme oil extraction like fracking” and phase out oil development in California. The Santa Barbara County Public Health Department warns that eating contaminated fish or seafood can cause illness. A fishing ban has been established by the state Department of Fish and Wildlife until data reflects that the fish are safe to eat. The ban extends from one mile east to one mile west of Refugio State Beach and a distance of half a mile off shore. Both shoulders of the northbound and southbound Highway 101 have been closed to all parking and traffic. The California Center for Toxicology and Environmental Health is performing 24 hour ambient air testing. They will do water and sediment testing during and after clean-up to detect substances harmful to human health and the environment. Several people complained of headaches or eye and throat irritation on Tuesday. The Santa Barbara County Public Health Department cautions that direct contact with oil can cause skin irritation, and breathing oil fumes can cause headaches, nausea, vomiting, confusion, lethargy, eye, nose and throat irritation and respiratory difficulties. To date there have been no levels of harmful substances detected that met threshold levels of concern, the Health Department says. 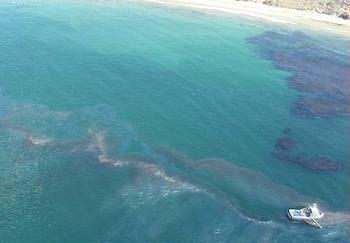 Whales, seals, dolphins and birds swimming in the area are at risk from the spilled oil. State wildlife rescuers have picked up five oiled pelicans for rehabilitation and are out looking for more affected birds. Those who come across affected wildlife are asked to contact the Oil Wildlife Care Network at 877-823-6926. People who wish to volunteer in the clean-up effort can find more information at Calspillwatch.com.